On a gloriously sunny Saturday a few weeks ago, I decided to go for a wander around Battersea. As I walked across Chelsea Bridge I was confronted by a hideous carbuncle (thanks for that, Charles) masquerading as luxury living accommodation situated between the bridge and the power station. 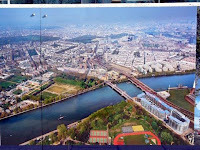 As you can see, in this snap of an illustration on the hoarding that runs around the site, the complex is ENORMOUS and really unsympathetic to everything around it. I went into the central area for a nose about and it felt like I was in a holiday complex on the Algarve, and there ought to be a golf course nearby. How does something as big and ugly as this get planning permission in London? It manages to make that QVC building look cute, and that's no mean feat. Anyway, rant over. Thankfully I saw this at the beginning of my day and forgot about it until now. hi! just saw you on londonist- am surprised you arent bombarded with comments by now. very good blog, will add you to my list of must reads... you havent got the follow me widget? 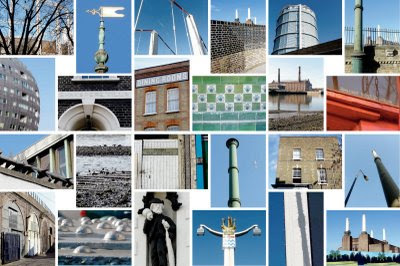 have you ever seen The London Book? Your work really reminds me of that ... I LOVE it. I love these pics! All the details are great and I love seeing them in a collage. Yay!